Naniwaya Okita et l'acteur Iwai Hanshirô IV sur fond micacé blanc. Gaufrage sur l'éventail. Signé Shuncho ga, cachets des collectionneurs Hayashi Tadamasa au recto en bas à gauche et G.P. (Guy Portier) au verso. 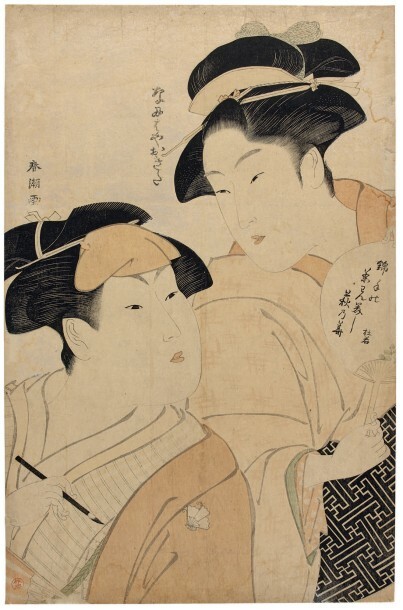 A double portrait of the courtesan Okita of the Naniwaya and the actor Iwai Hanshirô IV. The elegantly dressed woman holding a fan inscribed with a poem signed Tojaku, Hanshiro's poetry name, the actor holding a brush on the left; white mica ground, signed Shuncho ga, red circular collector seal lower left Hayashi Tadamasa and G.P. seal on verso (Guy Portier). Exposition: 1980, Tokyo, Tokyo Mainichi Shinbunsha, Toulouse-Lautrec et Utamaro (Rotorekku to Utamaro ten), n°133.